The pass of time has left its mark all over the Bages: from the agricultural territory within its valleys, through to heritage sites, (memories of its industrial past), and spaces where nature and culture cross in the service of people. Nature, spirituality, culture and tradition are some of the terms that define this singular mountain. 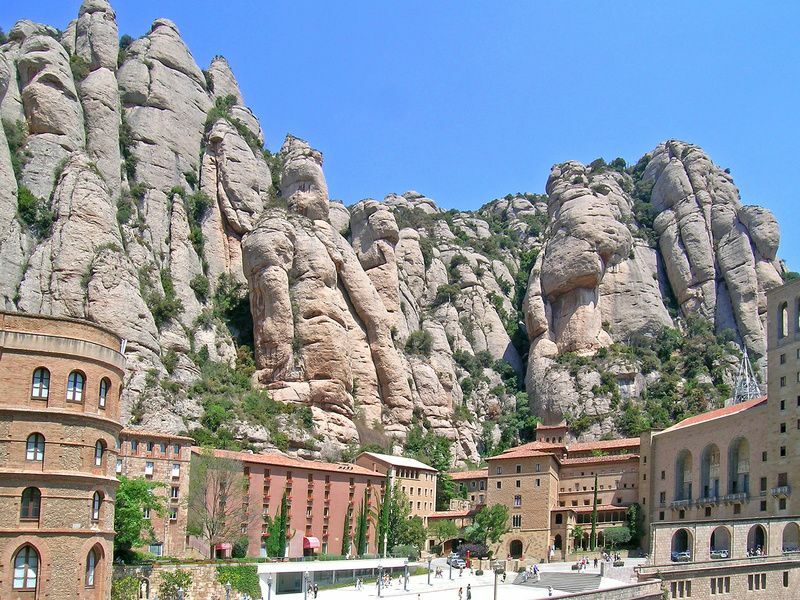 The sanctuary of the virgin of the same name (popularly known as ‘La Moreneta’), alongside an art museum that holds some of the greatest works in the history of art, make Montserrat a place that must be visited at least once in a lifetime. With the waters of the River Llobregat, industry made its fortune in the Bages during the 19th century, as demonstrated by tens of sites (the Sèquia Park, Abadal Winery, or the Cardona Salt Mountain) or the famous colonies which still today do no stop surprising. A result of the time, modernism and art deco also shine in Manresa, where thanks to the industrial bourgeoisie we can now admire the Casino, Casa Lluvià or the old warehouses of Can Jorba. In order to enjoy the essence of the Bages one cannot forget its connection to the territory: as much through the discovery of its natural scenery as through tasting the local produce. Geotourism and its related services allow one to develop rural tourism activities that reveal the environment, culture and way of life of its inhabitants. Unique spaces like the Natural Park of Montserrat, the Astronomy Observation centre of Castelltallat, the Central Catalan Geopark or the heritage ensemble of Sant Benet de Bages give shape to the identity and character of the region. H4 The ground and climatic conditions of the Bages allow the earth to provide vines capable of nourishing their own singular category, the Denomination of Origin of the Pla de Bages. Known for some twenty varieties, such as the Picapoll (with all its versions), Macabeu, Chardonnay, Garnacha or Syrah, among others. All the wineries of the area offer tastings, wine-pairings and several activities centred around the culture of wine, to which tribute is paid every autumn in the Bages Grape Harvest Festival. CUISINE AND FESTIVALS. Beyond its wine tradition the Bages produces products of the highest quality which have won a preeminent place amongst Catalan cuisine: the Rosa del Cardener tomato, the Castellfollit del Boix bean, olive oil or tens of varieties of seasonal mushrooms are some examples. In relation to its festivals and traditions, the Monistrol of Montserrat Cake and Mató Cheese Fair, the Medieval Fair or the Cardona Salt Fair, the Rice Festival in Sant Fruitós de Bages and the Traginers (arrieros) of Balsareny Festival are all obligatory visits.